Located in the Ortler Alps in Northern Italy, the Passo dello Stelvio is definitely one of the most often cited bucket list climbs for cyclists around the globe. Built in the early 1820s, the road over Passo dello Stelvio is easy to recognise thanks to the 48 hairpin turns on its northern side and striking tunnels on the southern face. First summited in the Giro d’Italia in 1953, it has been included a further 11 times since and also featured four times as a summit finish. It holds the title for being the highest ever summit finish in any of the three grand tours, and the most recent winner atop this mountain is Thomas de Gendt in 2012. The road has since been paved, and we now have much lower gears; nevertheless the Stelvio hasn’t gotten any easier! Due to its high altitude (the road reaches 2,758m at the summit), the Passo dello Stelvio is usually closed from November until May, and early-season pictures of cyclists passing over the summit often feature snow walls on either side of the road. With three separate ascents to the summit, cyclists can climb to the Passo dello Stelvio from Prato allo Stelvio, Bormio or via the Umbrail Pass from Switzerland. The ascent from Prato is over 25km in length and features the famous 48 hairpin bends and a steady gradient between 7.5-8.5%. The ascent from Bormio is somewhat different, with three distinct sections each separated by a short plateau featuring shallower slopes. The final 2km are the toughest on this side, with slopes reaching 11-12%. Finally, the ascent via the Umbrail Pass is 13km long, and features a steep section at the start and steadier gradients around 8-9% throughout. First included in the inaugural edition of the 7-day Haute Route Dolomites event in 2014, the Passo dello Stelvio made a memorable entrance into the Haute Route world as the time trial stage on day four. Riders finished in the fog at the summit, winding their way up to the top from Bormio. In 2015, the Passo dello Stelvio was included on the route but the stage was shortened and riders finished in Bormio rather than at the summit due to snow and low temperatures on the day. This was made up for in 2016, as the Passo dello Stelvio returned as not only a summit finish on stage three but also a time trial the following day on stage four. 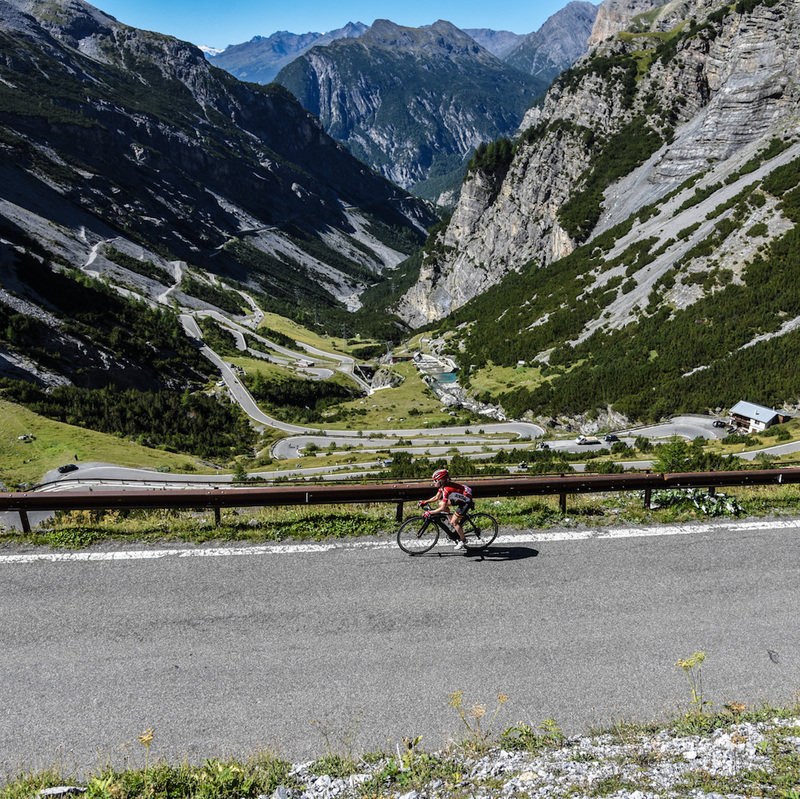 Since 2018, the Passo dello Stelvio has hosted the 3-day Haute Route Stelvio, based in Bormio, riders take on the Passo dello Stelvio on multiple occasions as well as other famous climbs in the region such as the Mortirolo and Gavia.